Maximum and a minimum of the previous trading day are regarded as a base of strategy. Most of the traders consider, that if maximum level of previous day extends is record high, then a price will go up, and on the contrary for a minimum level. Knowing these facts, we also will earn the profit if we will open the transaction with purchasing, at breakdown of a maximum of previous day and with sale, at breakdown of a minimum of previous day. But because other category of traders uses the same 2 points as support and resistance level, the price will not always move aside of breakdown of maximum and minimum of last day, that’s why it is a necessity to use Stop Loss of the fixed size. The exposed pending orders are valid from 00.00 GMT till 00.00 GMT next day. 1. 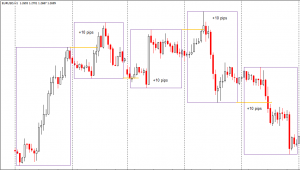 We expose at 00.00 GMT 2 pending orders – 1 on Buy ( above of the maximum of previous day +3 points ) and 1 on the Sell ( below a previous day minimum – 3 point ). 2. We establish Take Profit – 10 points. 3. 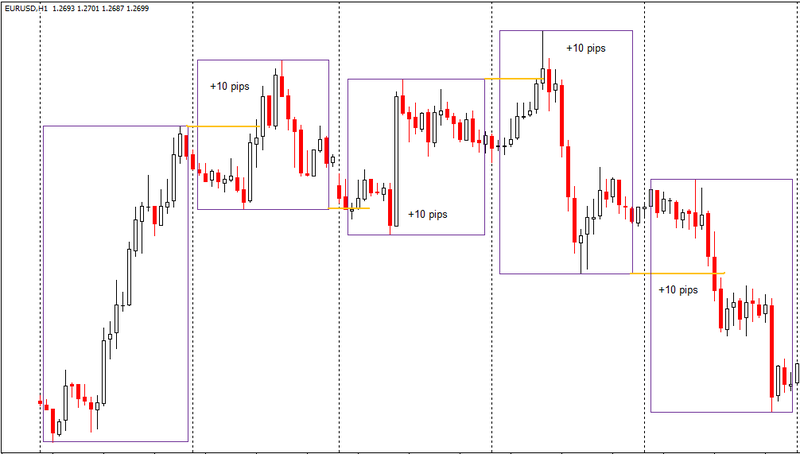 We establish Stop Loss – 30 points. It is important! It is necessary to pay attention only to 1 crossing of a maximum or a minimum during trading day : if the pending orders were closed on Stop Loss or Take Profit we can’t expose any other pending orders ). The recommended risk is 3-5% from each transaction’s deposit.